Anjanie Ramesar-Soom, front left, manager, corporate responsibility and community relations at TSTT, presents the trophy for the top team to Tidal Wave Aquatics' coach Hazel Haynes during the closing ceremony of Torpedoes Swim Team's first annual invitational long course competition recently. Looking on are Torpedoes’ reconciliation officer Kevon Thomas, right, and members of Tidal Wave. Tidal Wave were crowned champions and Haynes said it was a tremendous opportunity for young swimmers to test their current level. The first-time tourney was sponsored by communications solutions provider, bmobile. 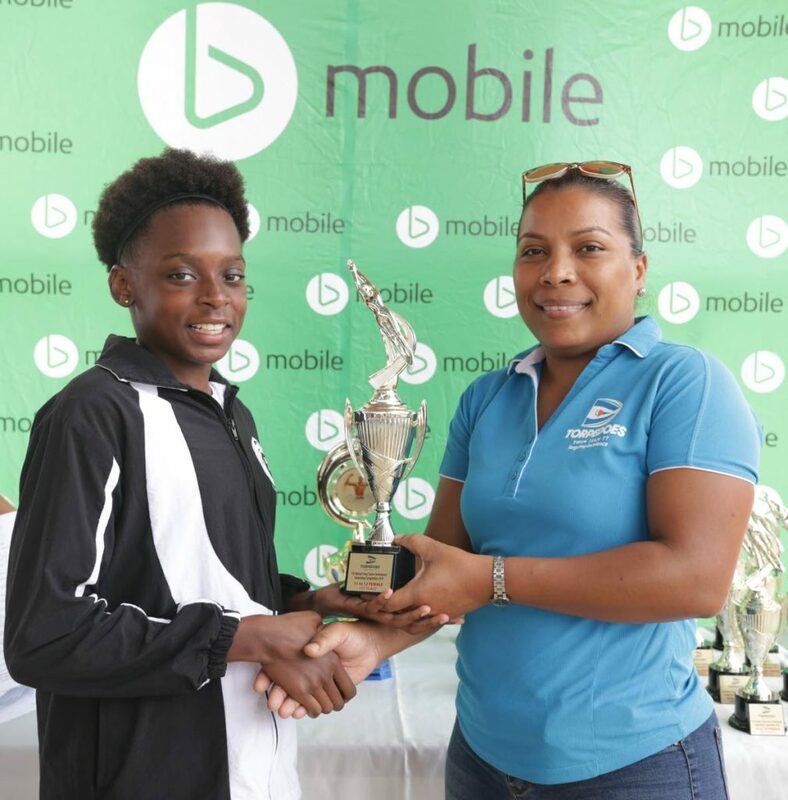 Tidal Wave’s Anpherne Bernard was in stunning form, shattering the national 9-10 boys 50m breaststroke record in 37.70 seconds, surpassing Josiah Changar’s previous record by 0.39s. Bernard also captured gold in the 50m freestyle, 50m backstroke and 200m individual medley as well as two silver and one bronzel. Joy Blackett (left) of Tidal Wave Aquatics, the top female swimmer in the 11-12 division, receives her trophy from Tamara Springer, Recruitment Officer of Torpedoes Swim Team TT, at the closing of Torpedoes’ first Annual Invitational Long Course Swimming Competition held at the National Aquatic Centre, Couva, recently. 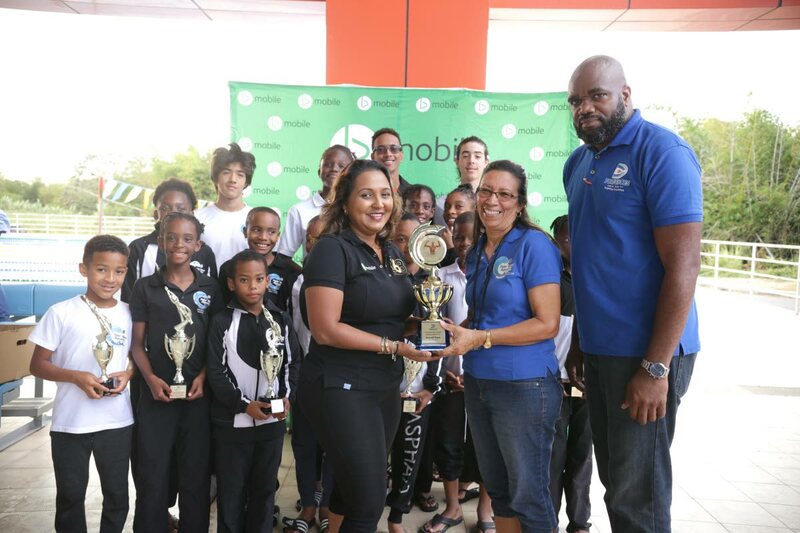 TSTT’s Manager Corporate Responsibility and Community Relations Anjanie Ramesar-Soom was on-hand to present the top swimmers with their respective individual and club prizes. One week prior, bmobile was also at the forefront of sponsoring the National Secondary Schools’ Swim Meet. Ramesar-Soom said bmobile has come on board with swimming and will continue to be a partner for the sport. Torpedoes founder, president and coach Ronald Corke expressed his gratitude to the main sponsors for their timely financial intervention. This was their first meet at held at the National Aquatic Centre and he said the club is intent on continuing its pursuit of swim development. The seasoned swim administrator said the club will host a developmental swim meet in April where budding swimmers will have a chance to assess and evaluate their progress. Having recently rebranded from La Joya Torpedoes Swim Club, Corke remains focussed on instilling a positive change into the sport on a national scale. “We can only grow from here. We must give the younger ones the opportunity to win. At Torpedoes, we are promoting youth in sport, like bmobile have been doing throughout the swimming community,” he said. Reply to "Tidal Wave coach hails impact of Torpedoes meet"